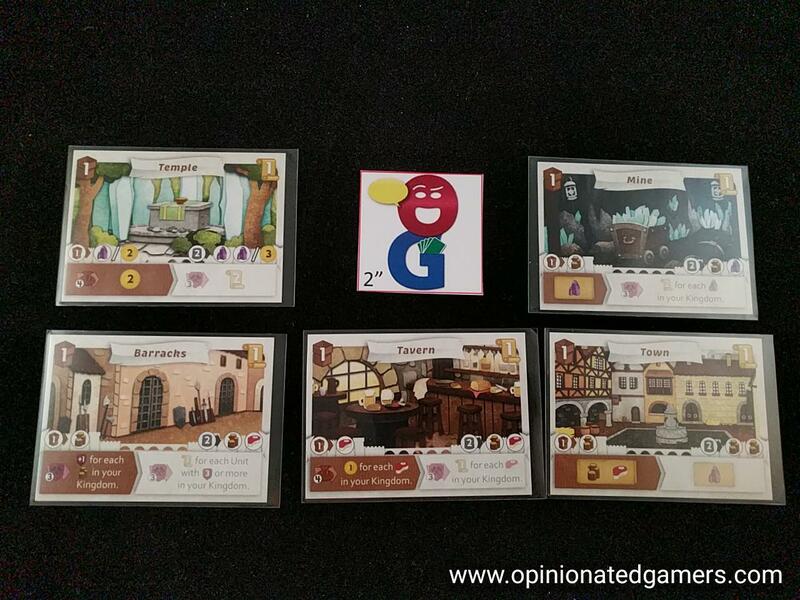 I was approached by Catch Up Games to look at their upcoming Essen releases (albeit in final prototype form). I have had pretty good success with their releases – SOL and Freak Shop last year – so I was interested to learn more. When I found out that the designer of the new games was Masato Uesugi, it became more a question of “how soon can you ship it here from Europe”. The game was originally designed in 2011, but it has been Japanese-only until now. Uesugi may not yet be a household name, but he is the designer of a number of games that I have very much liked in the past few years: Dungeon of Mandom (and Welcome to the Dungeon) and Lost Legacy. Both of these games current hold shelf space in my volume-limited permanent game collection, so I had high hopes for this game (as well as the other Uesugi release, Twelve Heroes). There is a scoreboard placed in the center of the table in setup. In the middle of this is a round chart, from 1 to 4. There is an arrow around the number in each space showing the direction of play. Gold tokens and Age tokens are in the supply. Finally, the deck of 81 Unit cards are shuffled and left as a deck to draw from. The game is played in 4 rounds, each with 6 phases. All players play simultaneously in each phase. 1] Recruitment – Each player is dealt 5 cards from the Unit pile and then a draft occurs. Players keep one card from their hand and then passes the rest to their neighbor in the direction shown on the round space on the scoreboard. The draft continues until all players have five cards. 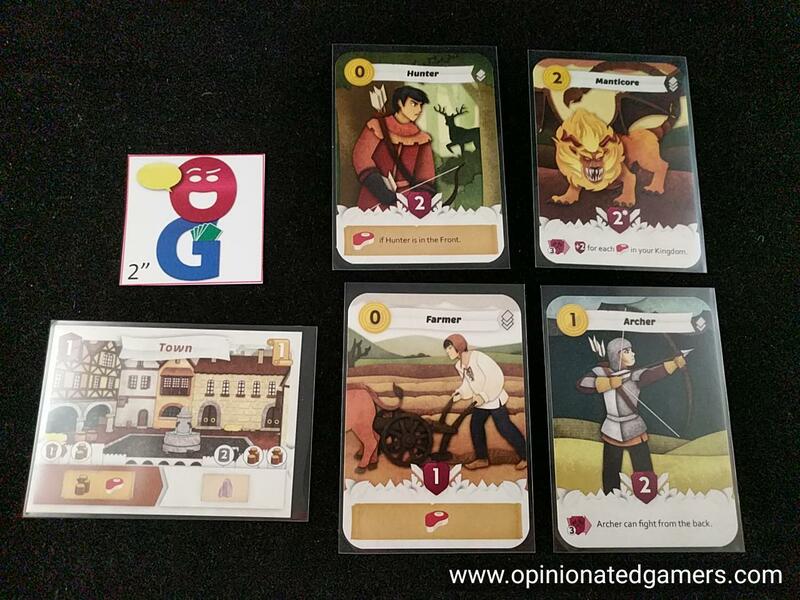 2] Deployment – Each player can choose to play units from their hand. Any cards chosen to be played are put face down in their desired locations. Remember, at the start of the game, you only have a 2×2 grid in which to play the cards. You can freely move previously played cards or you can even discard them to make space for a new card. When all players have chosen, the cards are flipped over, Gold is paid to pay the playing cost of each card. Some cards have instant one-time actions which occur right as the card is played; deal with these actions at this time. Additionally, there are actions specific to this phase found on some Units and Buildings. These happen now as well. At the end of this phase, players can only keep a single Unit card, and the rest must be discarded. The card kept between rounds is placed on the player’s Player Aid card. 3] Wars – Players determine their military strength by summing up the numbers in the purple shields – but only from the two cards in the Front row of the unit area. Then, players compare their strength with their left-hand-opponent and their right-hand-opponent. For each battle where the player has equal or higher strength than his opponent, he scores 3 Legend Points (LPs). Additionally, units/buildings that have actions specific to this phase take those actions now. 4] Income – Each player gets 2 Gold at a minimum, plus any extra gold provided on their Units/Buildings that have actions specific to this phase. 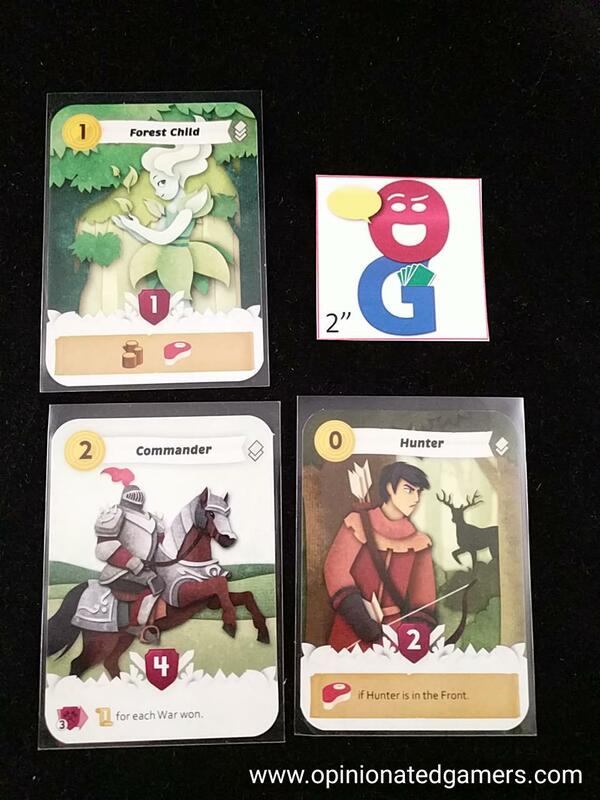 5] Construction – Units and Buildings each provide resources (looks like Steak, Wood and Gems). There are no tokens for these three types of resources; you “have” them if they are on your active cards. In this phase, you can do a single action from these two choices: Construct a new building OR Upgrade a building. To build a new Building, you must first pay 2 gold for EACH building you previous have built. Then, you must show that your existing buildings/units have the resources necessary to build the building. Remember that there are two levels to the card; it is possible to build the Level 2 side directly, but to do so, you must have the resources needed for BOTH sides of the card. To Upgrade a Building, you pay the costs only for the Level 2 side. You do not have to pay the Land cost again. This cost only occurs for the initial placement of the card. It is important to note that once you build your first Level 2 Building, you now get an additional space in the Front row of your Unit area. You only gain this bonus once; you will never have more than 5 Unit cards in play. As with the other phases, any actions on cards which are specific to this phase happen now. 6] Aging – Any card with an Age token on it at the start of this phase is discarded. 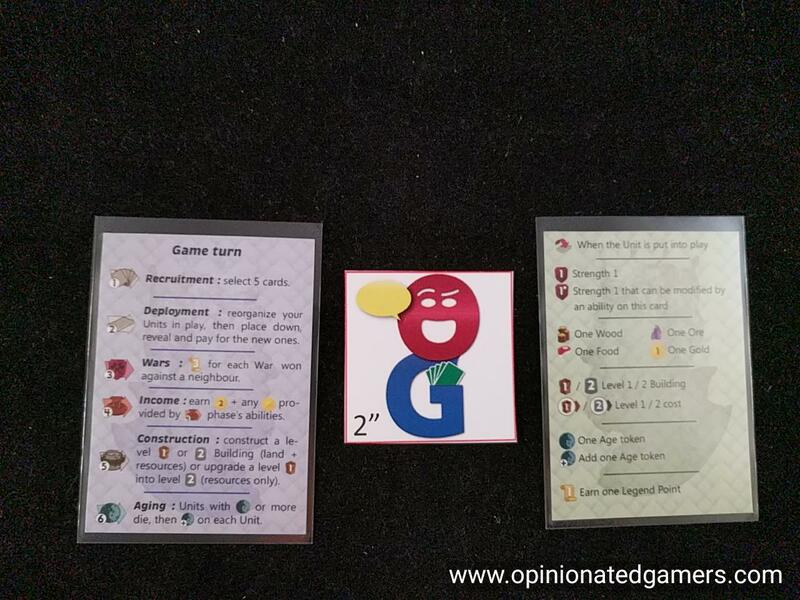 One Age token is then added to each card remaining in play. As with the other phases, any actions on cards which are specific to this phase happen now. At the end of the Aging phase, the game moves into the next round. Move the Time Marker to the next space; note how this changes the direction of passing in the next draft. If the fourth round is over, the game ends. Players now add to their current score any LPs shown on their buildings. The player with the most Legend Points wins. Ties go to the player with the most Gold at the end of the game. My first games have shown that the big decision early on is whether you’re going to focus on the building cards or warfare. Each of these two major routes offers plenty of LPs, but it’s unlikely that you’ll have enough time or gold to do well in both. It’s possible to score 24 LPs per game if you win every battle, and in a game that is often won by a point total near 50, this is not an insignificant portion of the total amount. The game is very tactical – you have to make the best that you can do with the cards available to you. As the deck is not stratified, you’ll come across some cards that are great in the early rounds of the game and some that are better suited near the end. Some cards may offer good cumulative bonus strategies, and if you get these in the first round, you might be able to build an entire game strategy around them. This same card in the fourth and final round might provide a nice small LP bonus, but nothing like the LP amount that could have been garnered with multiple rounds of play towards it. If you get a great (and expensive) end game card, you might end up keeping it as your holdover card until the final round when you can put it into play in a devastating fashion. Knowing the cards is an important piece of the game, and now that I’ve played 4 times, I think that I’ve at least seen just about every card used at least once. It’s just helpful to know what might be available for you in a later draw — or what you might have to defend against. 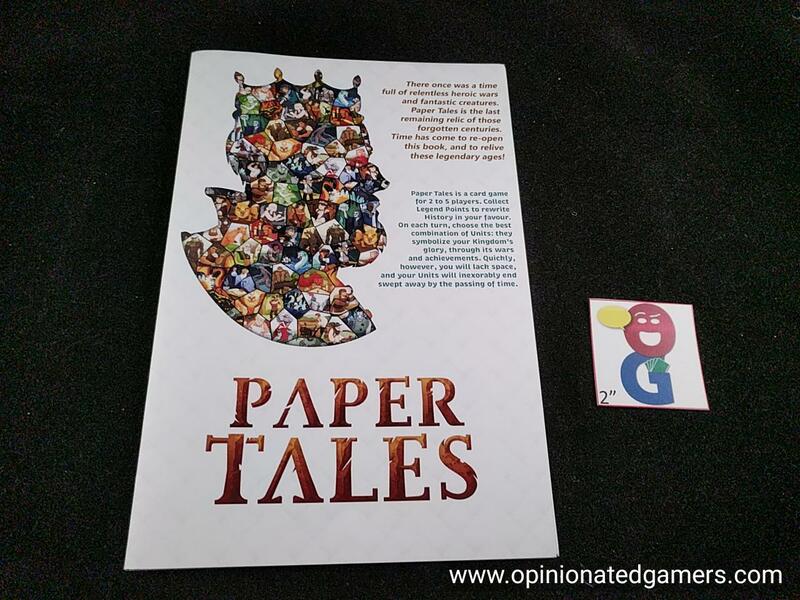 In a 4p game, you go through the entire deck once – so every card is theoretically in play; though obviously, many end up discarded when they are not put into play. I’m playing with a final prototype of the game, so I can’t comment on the quality of the components. But the artwork is pleasing to the eye, and I believe that it is final art. The icons are easy to understand and follow, and after a first game with the cards, there really aren’t too many questions on how the cards work or what the icons mean. The game itself plays super quick, and I can see an experienced group getting a full game experience in as little as 25-30 minutes. This is one of those games that I sort of wish was a few rounds longer – because I love the cycling of cards forced by the aging mechanism – but at the same point, the limited number of rounds makes each decision all the more important… this is a nice balance to have in the game. I’m definitely looking forward to further plays of this one, and this is a game that I definitely want to have a finished version of. I can see this taking one of the few spots in the permanent collection for drafting games. James Nathan (1 play): What a beautiful game. I really enjoy the two-row niche of card drafting games – though as far as I know, it consists of this and Age of Assassins, and I have trouble not viewing this through the lens of AoA. I think the design space of front row vs back row powers is interesting; here it is used more in the sense of the Card Monsters app where it largely corresponds of if the card can contribute to your military prowess. 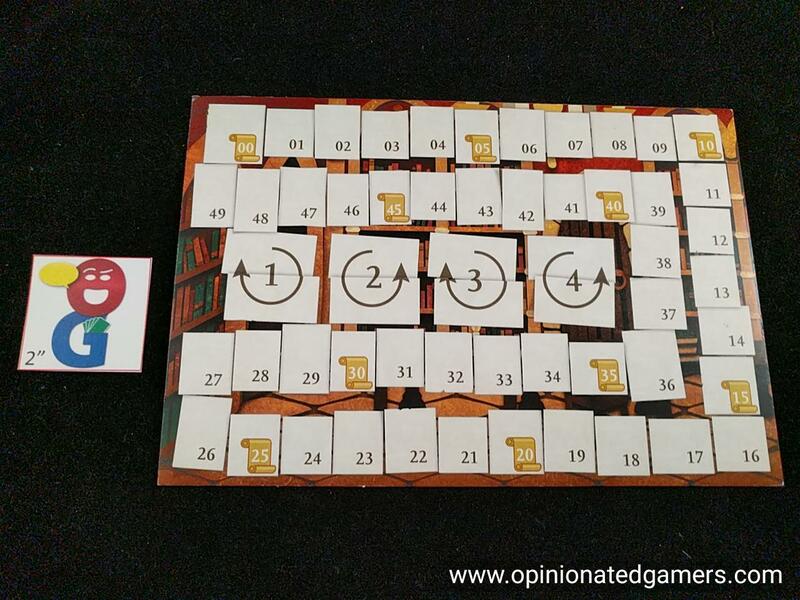 The aging mechanic is very interesting (but moreso if you come across one of the cards that plays around with that space), and the game ends just when you want one more round – in a “let’s play again” good way. What frustrated me was the “big deck of cards” approach (e.g. Race for the Galaxy); I think I would’ve liked to see a smaller stack where after repeated plays I could develop a better handle on what will be available to myself and my opponents. Mark Jackson (1 play): Counterpoint to James… I like the “big deck of cards” approach. (Of course, I consider RftG to be one of the best games ever made, so my bias is showing.) I liked the discovery of card combos that were going on and the various strategies we each tried.